The University of Texas at Austin invasive species research program is attempting to control invasive fire ant populations in Texas with South American phorid flies. PBS showcased this process in its “SuperNature – Wild Flyers” documentary this summer, made with help from the university. Phorid flies and fire ants are native to South America, where the 23 different phorid fly species help to control the ants. 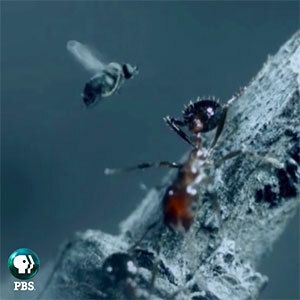 “[Phorid flies] are simply another tool in the toolbox of integrated pest management,” U.S. Department of Agriculture Animal and Plant Health Inspection Service Imported Fire Ant Quarantine Program Manager Charles Brown tells PBS. The process starts when a fly seeks out an ant and injects an egg into the ant’s thorax. When the egg hatches inside the ant, the larva wiggles into the ant’s head, where it feeds on the brain, making the ant act “zombie”-like. “There is no brain left in the ant, and the ant just starts wandering aimlessly,” says Rob Plowes, a research associate at the University of Texas at Austin. The larva later “steers” the fire ant away from its colony to fully develop. The ant eventually dies, and the fly decapitates the host. The process is repeated. “They’re not going to completely wipe out the fire ant, but it’s a way to control their population,” said Scott Ludwig, an integrated pest management specialist with Texas A&M’s AgriLife Extension Service. “The goal of our program is to provide a scientific basis for ongoing biocontrol efforts to establish a suite of phorid fly species and pathogens for fire ant biological control. The effectiveness of such biocontrol is expected to depend on the suite of introduced phorid species, coupled with other parasitoids and pathogens acting synergistically and having greatest impacts during periods of environmental stress.